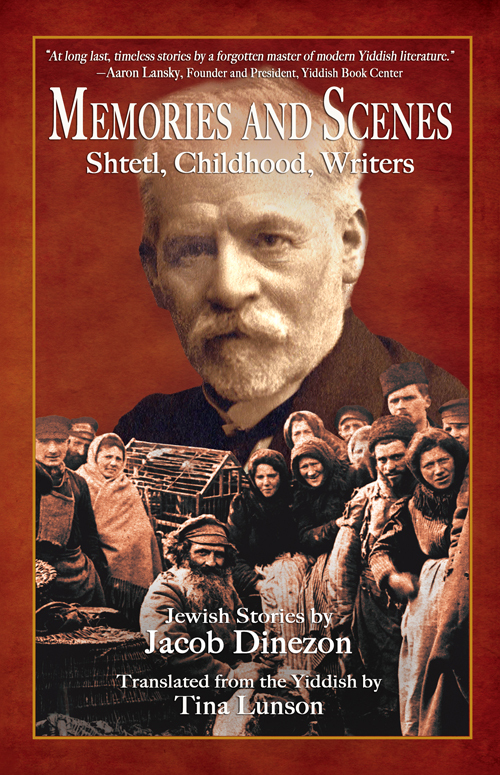 Memories and Scenes: Shtetl, Childhood, Writers is the first English translation of eleven autobiographical short stories by the 19th century Eastern European Yiddish writer, Jacob Dinezon (1851?-1919). A beloved and successful Jewish novelist who championed Yiddish as a literary language, Dinezon befriended and mentored almost every major literary figure of his day, including the three classic writers of modern Yiddish literature, Sholem Abramovitsh (Mendele Moykher Sforim), Sholem Aleichem, and Isaac Leybush Peretz. Though Dinezon’s place in the development of Yiddish literature has been neglected over time, the publication of these stories sets him firmly in the ranks of his fellow Yiddish writers and finally makes this collection available to current and future generations. Through poignantly drawn characters and keen observations, Dinezon offers a firsthand look into 19th-century shtetl life and provides a treasure trove of Yiddish history, culture, and values. Jacob Dinezon, like Charles Dickens, championed the poor and oppressed, especially children. Called the first sentimental writer of modern Yiddish literature by literary scholars, Dinezon used his pen to expose the hypocrisy and injustice in urban and shtetl society, and his stories reveal a deep love and commitment to uplifting and enlightening the Jewish people. In this collection of never-before-translated stories, Dinezon recalls his childhood years in the shtetl, the colorful characters he encountered along the way, and the events that ignited his passion for writing. Tina Lunson is the former administrative director and senior consultant to the Vilnius Program in Yiddish Language and Literature at Vilnius University in Lithuania. She worked with the U.S. Holocaust Memorial Museum as an expert researcher and translator, and served as an historical consultant and on-site guide for two Holocaust-era films in Lithuania. Lunson received her Master of Arts in Jewish History from Baltimore Hebrew University and has completed post-graduate work at Columbia University in Yiddish Literature. Her English translations of Yiddish works include Jacob Dinezon’s Memories and Scenes: Shtetl, Childhood, Writers and The Dark Young Man, Holocaust memorial books, and commissioned translations of personal correspondence and diaries. Scott Hilton Davis is an Emmy Award-winning filmmaker, author, storyteller, and collector of Jewish short stories from the late nineteenth and early twentieth centuries. Convinced of the historical, cultural, and ethical significance of stories by Sholem Abramovitsh, Sholem Alei­chem, I. L. Peretz, and the lesser-known writer, Jacob Dinezon, Scott now uses storytelling and publishing to bring works by these beloved Jewish writers to new audiences. He is the author of Souls Are Flying! A Celebration of Jewish Stories and Chanukah Tales from Oykvetchnik. Memories and Scenes: Shtetl, Childhood, Writers is available in paperback and Kindle ebook. Buy online or special order from your favorite bookstore.